When life or property is at stake, the reliability of support services, such as the GPS Navigation used by emergency responders is crucial. Today, most of the available systems depend on constant internet connectivity, which once lost, become unreliable. Offline operational capability, high reliability of the software and specially defined maps allowing emergency vehicles to enter pedestrian zones and roads closed to regular vehicles are the main reasons why Sygic Professional GPS navigation software with emergency maps has been the preferred choice of institutions like the German Police force or Polícia Militar do Brasil. Today more than 13 000 police cars, 1500 fire trucks and 1000 ambulances in Europe and in the Americas are equipped with Sygic Emergency Vehicles Navigation. 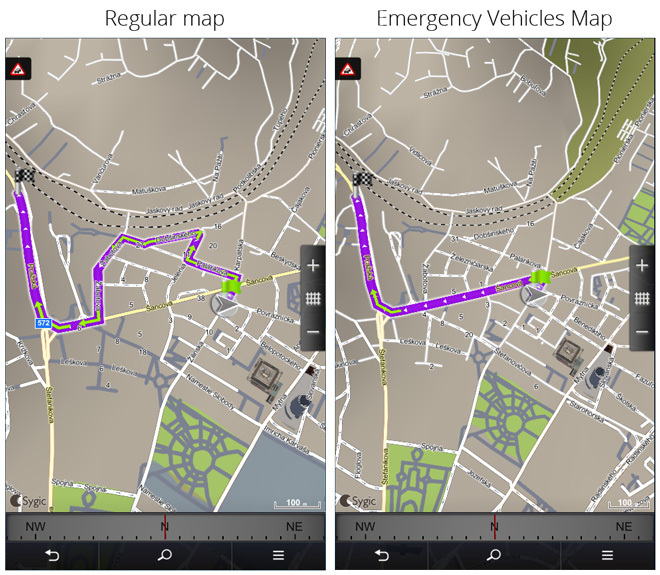 Here below an example from Sygic Emergency Vehicles Navigation showing the advantage of Sygic emergency vehicles routing using specially defined emergency maps. 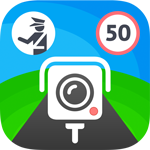 Information about special permissions for emergency vehicles are integrated in the map data, allowing Sygic to route vehicles with blue lights more efficiently and to the locations not available for regular vehicles. This helps emergency responders get to the incident faster. Besides the main advantage of being able to continually direct emergency responders when broadband connectivity is not available, Sygic Emergency Vehicles Navigation is very easy to integrate into any CAD solution, thanks to the powerful Sygic SDK and broad hardware compatibility. This allows system integrators of solutions for emergency responders like Hangar 14 Solutions, IAV automotive engineering or Nastek to create powerful and cost-effective solutions. Many smaller departments or private security services feel important economic pressure. Due to the very high costs of available CAD systems, they still don’t have any or they operate with obsolete IT infrastructure. Yet, smart and powerful technology does not have to be expensive. Sygic’s experience with GPS technology and mobile applications has led us to develop a fast to deploy, easy to use and yet very powerful Security & Emergency Dispatch system that integrates with Sygic Professional GPS navigation with Emergency maps for only a fraction of the cost. With a small investment, and within literally 5 minutes after installation, dispatchers are able to dispatch assignments, monitor interventions, record detailed reports and communicate with units operating in the field in real time. Both products will be available on display at the IACP conference that is taking place in Chicago from the 25th to 27th of October 2015. Don’t miss a chance to try it out and have us answer your questions at our booth no. 5251.